Mohamed Salah scored twice to move two goals clear on top of the Premier League's scoring charts and lead Liverpool to a thrilling 4-3 win over Crystal Palace on Saturday. Salah took his tally to 16 league goals, ahead of Arsenal's Pierre-Emerick Aubameyang and Tottenham's Harry Kane, who both netted 14. Premier League leaders Liverpool recovered from a poor first-half display as they came from behind to beat battling Crystal Palace in a goalfest at Anfield. 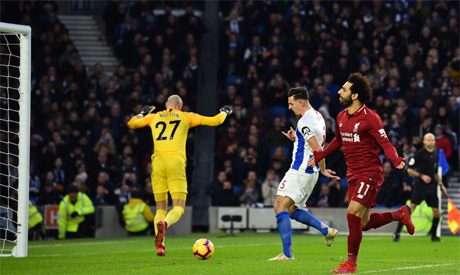 The win, secured by late goals from Mo Salah and Sadio Mane, moves Juergen Klopp's side seven points clear of Manchester City, who face bottom club Huddersfield Town on Sunday.